Screening Just Got An Upgrade. A New Approach to Video Screening. The new standard in asynchronous video screening features a smart workflow and robust functionality in an easy-to-use interface. 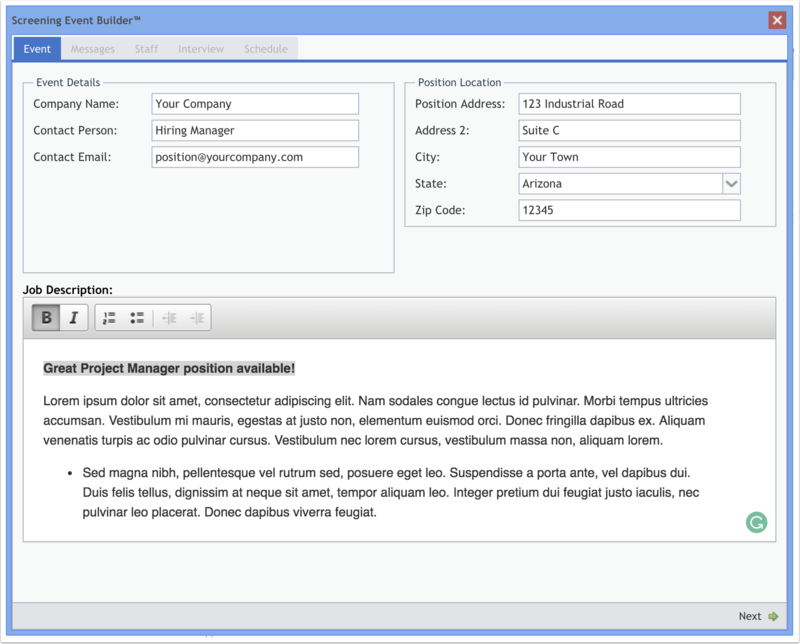 Create screening events, evaluate candidates and store them in your database. 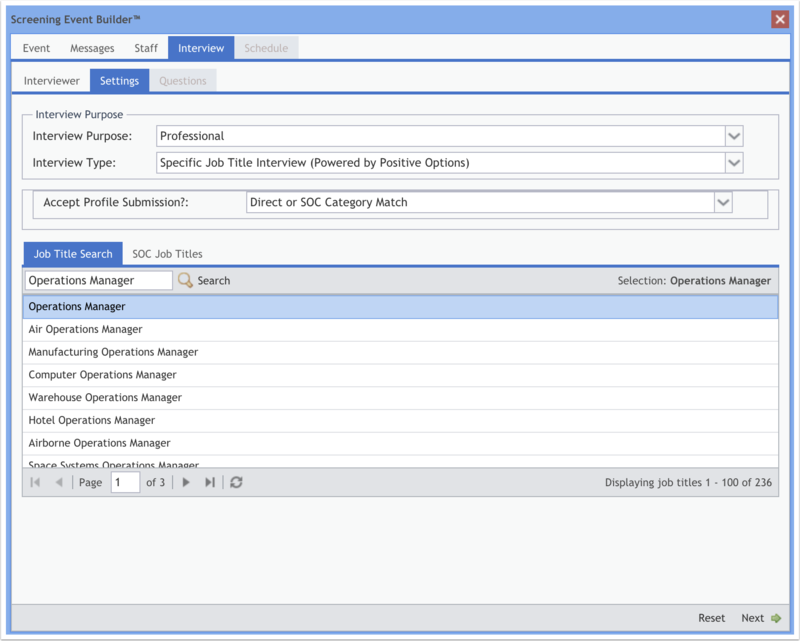 Pointe Savant® redefines this continuum – giving recruiters and hiring managers the ability to deploy and manage events while accepting self-service interviews created by candidates. No Email Chains Or Scheduling. Delegate and Stay In Control. Add Staff & Build Your Team! Candidate screening in Pointe Savant® can be accomplished by one person or by a team. 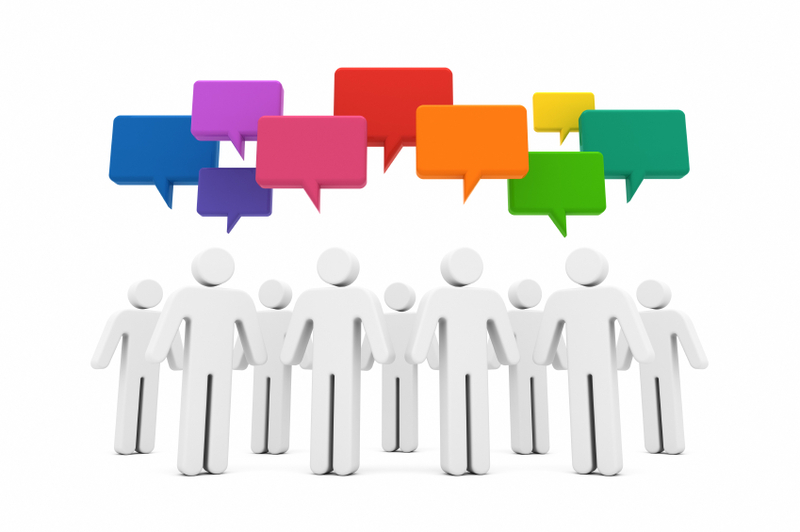 Simply add staff members to your account and assign them to the appropriate screening events. When you’re ready to delegate screening tasks to other team members, Pointe Savant® makes adding staff easy. 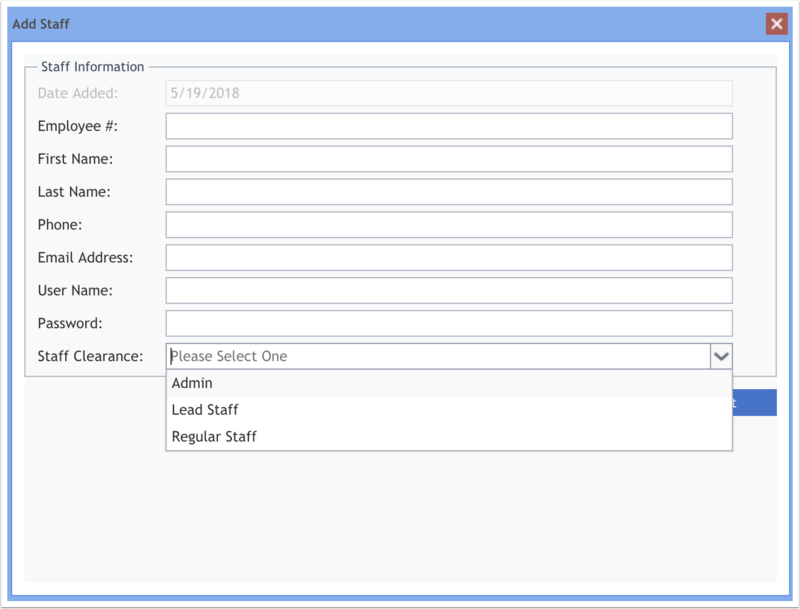 Just click the “Add Staff” button, enter the new staff member’s details and share the credentials with the new staff member. Staff members can only see screening events they’re assigned to and have no knowledge of other staff assignments. Updating staff information or removing staff is easy. **Note – The number of staff members added depends on the subscription level. Refer to the help guide for details. 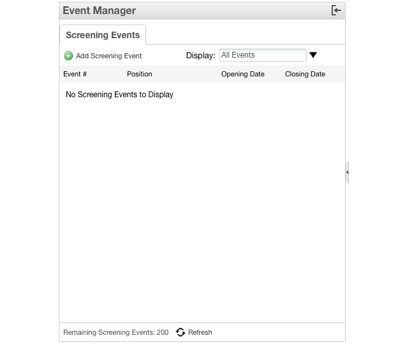 Manage Your Screening Events Like a Boss. When you open Pointe Savant® the first time, your Screening Event List will be empty (move the slider in the photo to the right). After creating your screening events, they appear in the Screening Event List. (move the slider in the photo to the left). Managing events is easy! Locate your events sorting by job title, opening date, closing date, or screening event number. Use the powerful filter for displaying currently open, closed, or canceled events to find what you’re looking for fast! 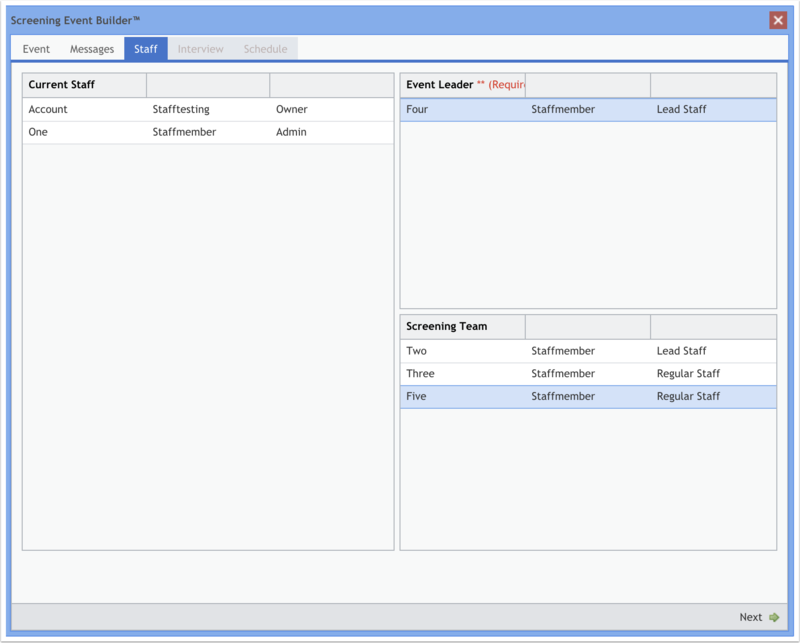 Screening Event Builder™ Makes it Simple! Creating interviews is easy with Pointe Savant®. Just complete the 7 steps in the Screening Event Builder™ widget to create, deploy, and manage asynchronous video interviews like a pro. 1. Enter the Event Details. Enter the Screening Event details along with a job description. Staff members will be able to refer to this information throughout the screening process to stay on track and in alignment with screening objectives. 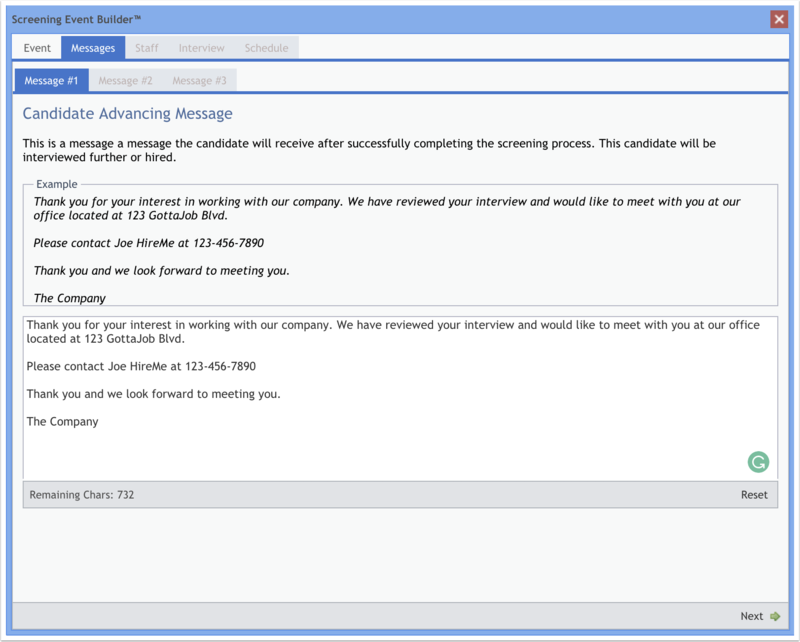 Pointe Savant® automates the task of notifying candidates when the screening event concludes. In this step, 3 messages are composed. The first is for candidates that will advance to the next level of your screening process. The second message is for candidates who will be saved for later. (Most of the candidates screened will get this message). 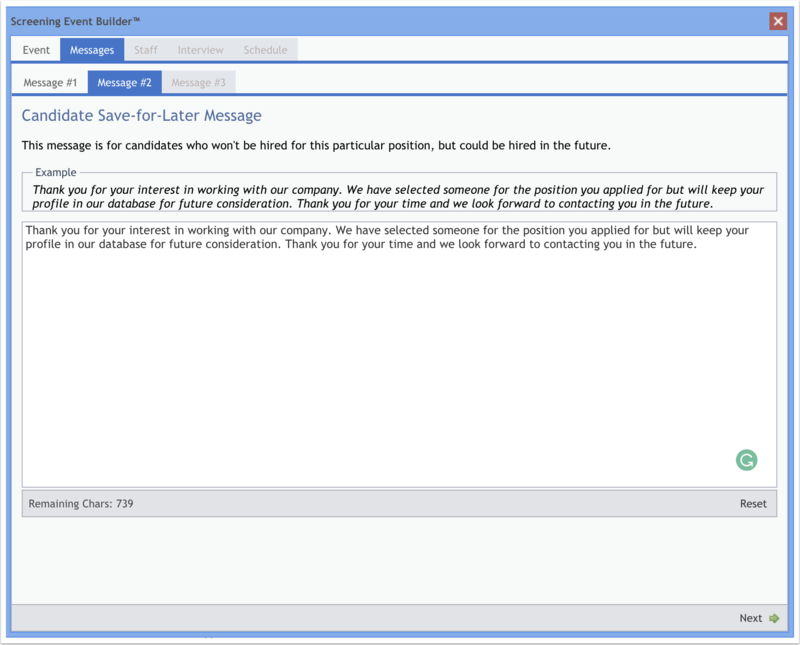 The third message is for candidates unlikely to be considered for future positions with your organization. Choose the staff to perform the screening on your event. Regular Staff members can only see the screening events they’re assigned to and make recommendations to advance, reject or save a candidate for later. Lead Staff members review the recommendations and make the final decision. 4. Choose Interviewer and Language. 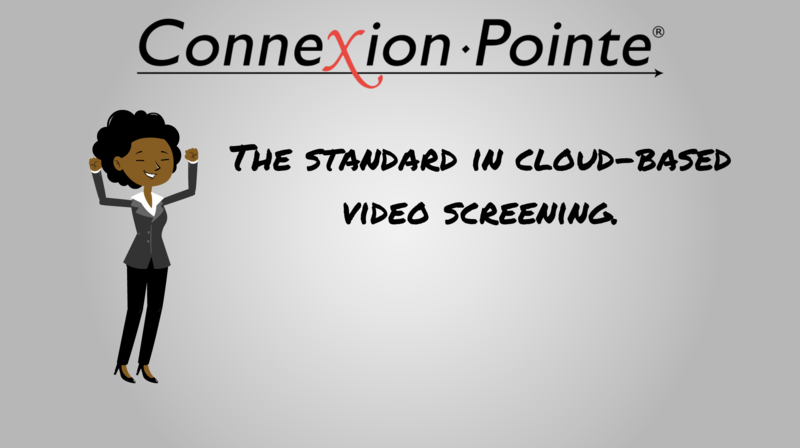 All Connexion Pointe® interviews feature simulated face-to-face interviews. Choose male or female avatars from multiple ethnicities and languages to match your organization’s workforce and culture. American English and Mexican Spanish are currently supported with more languages to come. Pointe Savant® supports professional screening, student admissions, and exit interviews. Professional interviews can be general or job-title specific with titles based on the U.S. Standard Occupational Code. Undergraduate, MBA, post-graduate, medical or dental school interviews are supported for student admissions. All screening events provide the option to accept interviews created by candidates. With dozens of competencies and themes to choose from, you’re sure to find interesting questions for your candidates. Our Job-Title Specific Interviews (Powered by Positive Options) feature a suggested competency set for your chosen position. Just click each skill to view its questions and select up to 6 for your interview. 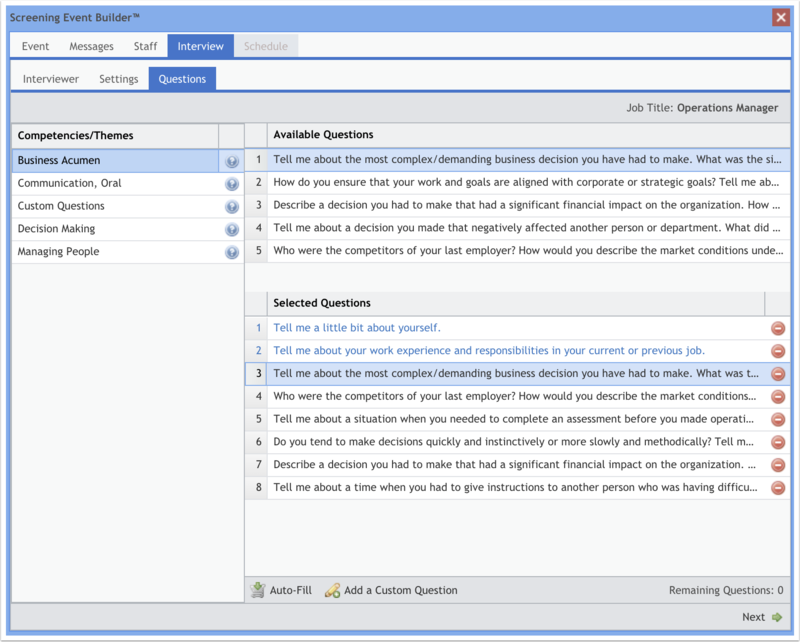 Pointe Savant® has a powerful text to speech engine that supports your customized questions. A screening event is a period that interviews can be recorded or submitted by candidates. Here, you can determine the length of your event by selecting a cut-off time and date. Links for screening events can be shared immediately after creation. Once selected, just click “Create Screening Event” and you’re done! Maximize your video screening with Bring Your Own Interview™. Recruiter chooses specific questions and requires candidates to answer them. Recruiter chooses specific questions but allows Bring Your Own Interview submissions by candidates. Recruiter encourages candidates to submit Bring Your Own Interview submissions between hiring cycles. 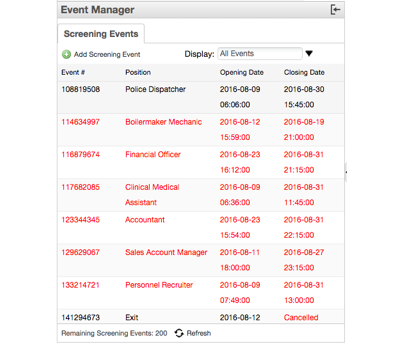 When you locate and select your event, the Screening Event Workspace is displayed. (Move the slider on the photo above to view the tabs). Job Posting Tab: (move the slider right) Here, a copy of the screening event details keeps your staff on the same page with screening objectives. Just include the link wherever your candidates are sourced to invite them to your event! Candidates Tab: (move the slider left) This is where your staff performs most of the candidate evaluations. Evaluating Candidates with Pointe Savant® is straightforward and simple. (see the photos left to right below). The first tab has the candidate’s contact information, photo, and a link to view their resume in PDF format.The resume opens in a tab or window, where it can be saved, shared with staff or printed. Recruiters who prefer starting with the resume start here. If the resume sparks interest, the next tab conveniently displays the interview and optional video content prepared by the candidate. 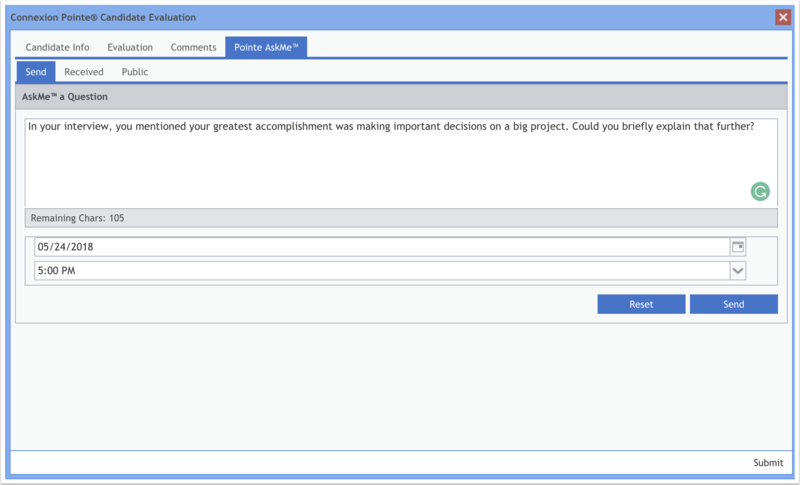 Staff can rate responses to interview questions by clicking one or more of the stars next to each question. The third tab is where staff can enter notes, comments and a recommendation to advance, reject or save the candidate for later. If your team has follow-up questions, the Pointe AskMe™ tab is the answer! First, they can check the “Public” tab to see if their follow-up question has already been asked and answered by the candidate. Then, they can enter their question, choose a deadline for the candidate response and click send – all in the same easy-to-use interface! 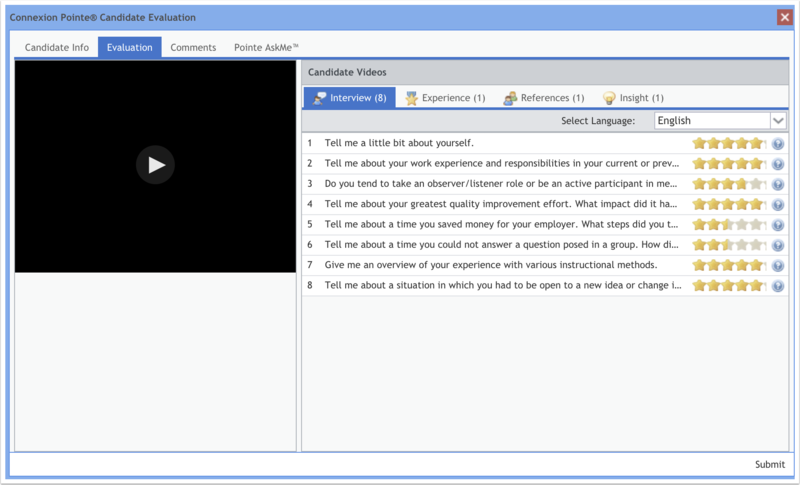 Candidates appear in the Candidate Screening List (move the slider in the photo to the right). After candidates are evaluated by staff a Lead Staff member makes the final decision by moving each candidate to one of the lists (move the slider in the photo to the left). Keep All of Your Candidates in the Loop. Contacting candidates after screening events is just good business. Notify your entire candidate pool in just a few clicks. At the conclusion of your screening event, Pointe Savant® makes it easy to wrap things up and file everything away in just a few clicks. Closing an event displays the outgoing messages created with the event. 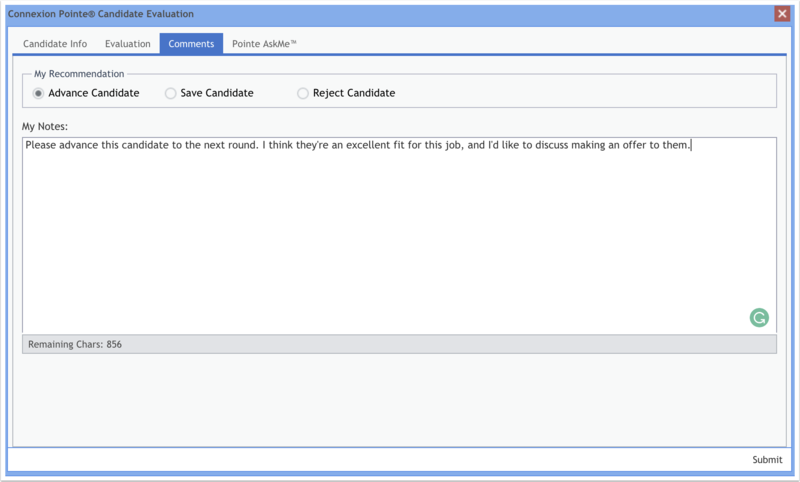 Each message is automatically delivered to all of your candidates according to the list they’re on. Pointe Savant® notifies as few as 1 or as many as 2500 candidates in a single click, and without sending a single email! Now you’re ready to do it again! This time, source candidates here before going public. Candidate Resources – Your Candidate Resources database increases in value over time because every record contains a video interview! Start here before sourcing outside candidates to save time and money. The Open Submissions tab is a convenient place to store unsolicited Pointe Profile® submissions. This exclusive feature essentially converts candidate screening into a self-serve shop between recruiting cycles and is not available on other platforms. Records here are searchable by name, position sought, or submission date and can be added to open screening events for evaluation in just a few clicks. 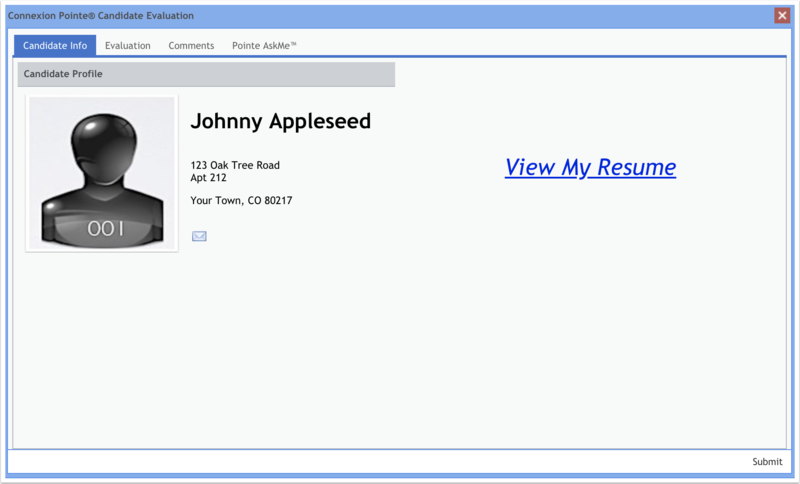 The Evaluated Candidates tab stores candidate records after participating in screening events (move the slider in the photo to the right). Candidates are searchable by name; position sought, submission date, or the result of their last evaluation. View search results (move the slider in the photo to the left) “at-a-glance,” or drill down into any candidates’ previous interviews, video content, staff notes, and recommendations. With Pointe Savant®, your screening efforts are maximized, increase over time, and deliver continued ROI! Some candidates may express their interest in your organization by submitting resumes several times over months or years. If your staff determines there is simply no possibility of a particular candidate joining your organization, why go through the trouble of reviewing their information every time they reach out to you? 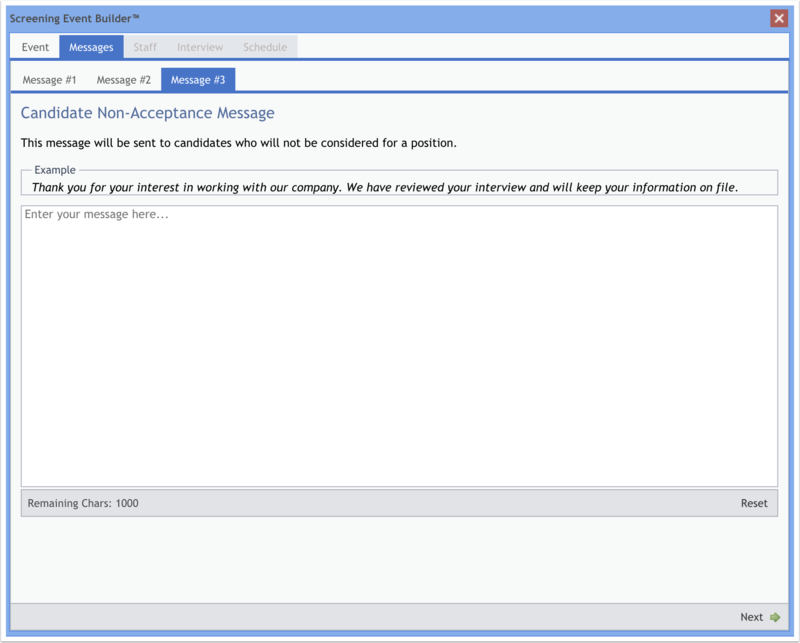 Before diving into a Candidate Screening List containing hundreds or even thousands of candidates, the Purge Rejected Candidate button identifies any candidate previously rejected by your staff, saving precious time and money. Lead Staff can review these candidates at any time to determine if reconsideration is appropriate. Some candidates require recruiting. Others don’t. Either way, a great candidate experience is good for business. 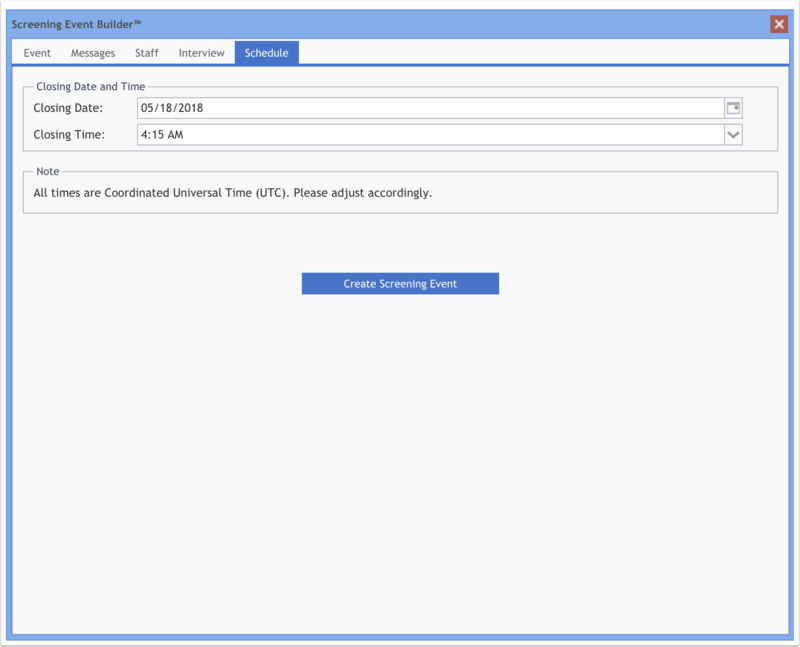 Pointe Savant® offers practical tools that automate feedback and let candidates know you respect their time and appreciate their interest in connecting with you.